When I wrote about Downton Abbey and its Crêpes Suzettes a few months ago, I made the acquaintance of the purported creator of said crêpes, Henri Charpentier for the first time and I was smitten. I wanted to pick up his autobiography after reading the story of the birth of the dessert that took place at the table of the future King of England. True or not (would they really let a 15 year old, no matter how precocious he may be, serve England's Prince Regent? ), it was a great story that you want to believe because he is so adorable. The Modern Library reprint of his book, Life a la Henri: Being the Memories of Henri Charpentier (Modern Library Food), was a joy to read. For those of you unfamiliar with the series, the wonderful and amazing former Gourmet editor Ruth Reichl put together a small collection of truly great but nearly forgotten food books from the early 20th century that became the Modern Library Food Series. It was only fitting that it came out at the dawn of the 21st century. The series included Clementine in the Kitchen (about a the Chamberlain family and their French cook), Marcel Rouff’s fictional chef, Dodin-Bouffant, Pomiane as well as the Charpentier book. Each has a brilliant opening from Reichl (I love the way she writes… she could make watery gruel sound like the sexiest food on the planet) and guest forewords by a stellar crew of modern writers… many of whom were inspired by the books they write about. In Charpentier’s case, no less a food luminary than Alice Waters shares her love of this little book and the effect it had on her when she read it early in her life. To say Charpentier has a joie de vivre is putting it mildly. Even in adversity, he triumphs and rushes onward and upward. Waters put it beautifully when she said, “…he resembles…a beaming, benevolent and sometimes blustering grandpapa, white mustache dancing as he acts out for the little ones the extravagant story of his life. Does he exaggerate? Perhaps. But he does so for the sake of a good story, and with such ebullient innocence and pride that we can easily forgive him his flamboyance.” He got to Waters with his insistence on fine ingredients and dismissal of fussy garnishes that served no purpose. She said she still loves Crepes Suzette and often makes them at Chez Panisse –– doubtless with little Henri in mind with each buttery, sugary, orangefully-boozy mouthful. Charpentier was born in 1880. He is discreet about his origins but hints that there may have been an unsanctioned romance between his young, high-born mother and a father who was less so (he was an older lawyer who died shortly after Henri’s birth). Henri was dropped off at a country farm to be cared for by his wet nurse and then it seems, he never saw his mother again. He is much more definite about his relationship with his adopted family named Chamous in the city of Contes, whom he loved. They were poor, simple folk but there was also a well-respected chef in their midst –– his adoptive brother Jean. 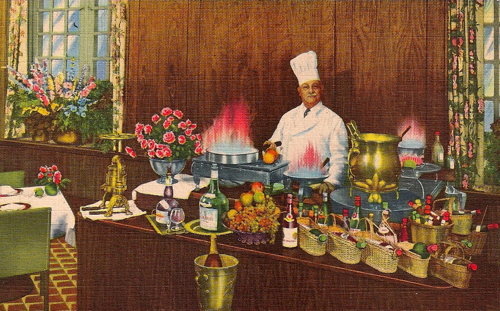 It was through the Chamous families’ eldest son Jean’s influence that he advanced through the stratosphere of the European restaurant business, beginning in Monaco at the luxurious Grand Hotel in Monte Carlo (where the happy accident with the crepes and the Prince was to have happened) and then on to hotel Cap Martin all the while working his way through the front of the house and learning the ways of great restaurants. This served him well as he traveled to England to learn English at 12 (no great Maiître d’ could ascend to top, front-of-the-house positions in the Continent’s finest restaurants without English). Back and forth across the channel with his illustrious French chef adoptive brother, he learned and grew in his craft. 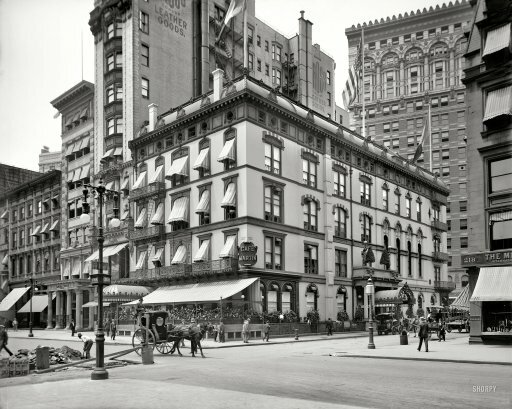 Eventually this led to America and the famed kitchen of Café Martin in Manhattan. Listening to Henri’s stories, you sort of felt, no matter what, that little Henri was blessed by those he worked with and for and even his clients. Café Martin’s owners and managers helped him with his little restaurant in Lynbrook, LI. Yes, he hardly slept and worked at Café Martin to pay the bills as he got his place going but he was terribly happy with his wife and their restaurant. Poor, but happy and his clients were the rich and famous he had met and charmed in the city. Many had houses out on the island. This all went well and gave him money and respect –– until prohibition when he lost most everything and went back to Europe for a time. He returned to the States as a hired gun, hired to run the Rainbow Room in Rockefeller Center after prohibition wiped him out (how DO you cook great French food without wine?? 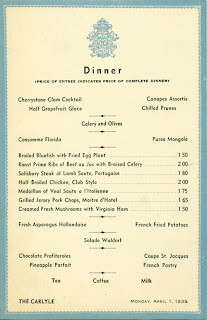 –– no wonder American cuisine went through a dead spell after prohibition). Then it was on to Chicago and finally out west where he fed one table at a time at his house…booked a year in advance. The back of the book includes 65 pages of his favorite recipes. Normally deciding what to make would be a tough decision, but when the time came, it was simple –– it was already on my radar. Purée Mongole. What is that, you may ask? 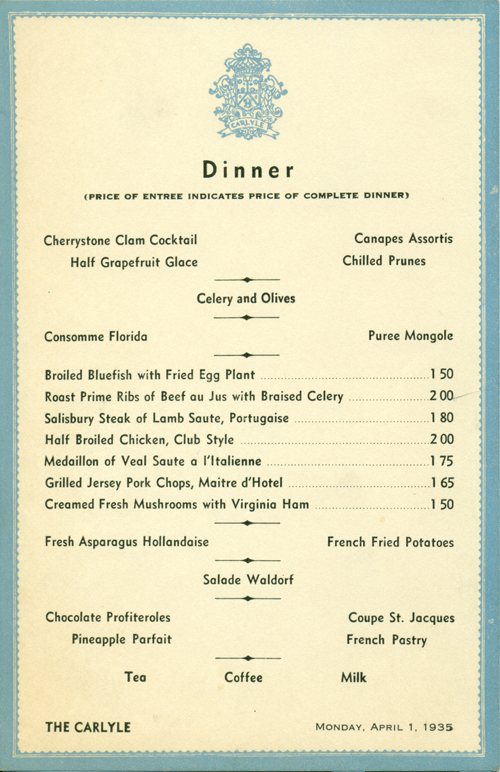 I had already looked it up during my holiday perusal of 1930’s Manhattan nightclub menus for Nick and Nora and the Rainbow Room –– because, I admit it, the name is pretty compelling and I had never heard of it. It was on a few of the grand old menus I looked at but I had never heard of it, shame on me. Evidently it was big at The 21 Club and The Carlyle. It was terribly popular in the 30s and there are many, many recipes for it. Even The Joy of Cooking has one for the soup. The first thing you find out when you look up Purée Mongole is that it was J. Edgar Hoover’s favorite soup (from the sweet little blog, Soup Song) –– the blog says that FBI historians will tell you so if you ask). A little more digging finds the guy ate mostly the same thing for lunch for decades at the Mayflower Hotel in Washington, “chicken soup, lettuce salad, cottage cheese, grapefruit, and buttered toast” with his own home-made diet dressing –– always on a diet –– boring. Evidently, his true love was this soup, which is remarkably ironic since it was also a favorite of his nemesis, JFK . Although its preparation seemed to have devolved into dumping a can of tomato soup and a can of pea soup into a pot and tossing in a pinch or curry and/or sherry, Henri’s recipe is quite fine and fresh. I cheated a bit with the tomatoes since March tomatoes are not terrible good and Muir Glen’s are bursting with flavor… I used canned tomatoes and frozen vegetables this time around but am looking forward to giving it a try in summer when everything is fresh and good. It is a breeze to make (basically heat and purée) and good for you. I used a little less liquid than he did and cooked the white beans beforehand since I wanted the vegetables to be soft but not overcooked mush. Also, and this is just me, I didn’t want brown soup so I did the tomato and pea components separately… made it look bright instead of deathly… your choice. Just cover the beans and peas, navy beans, celery and onion with water and cook till softened Purée the mixture (I always put in some of the liquid and add more as needed instead of making it too watery). Add milk, and consommé and boil and then add this to the puree and strain if you want a silky texture, otherwise leave as is. Peel the tomatoes if using fresh, heat with the butter and the curry powder, then purée and strain and reserve. If using canned tomatoes just cook with butter and curry powder and strain. When ready to serve, heat the bean purée and add the sherry. You can put the tomato and bean purée together and cook or do it separately and join as you serve. If you would like the richness, pour the cream into the bean puree or put spoons of cream in the bottom of individual bowls and then add the soup. It is good without it and much lighter and the buttered tomatoes provide the richness. Henri recommends 2 parts bean to 1 part tomato. A beautiful soup with all the fresh green flavors of spring! 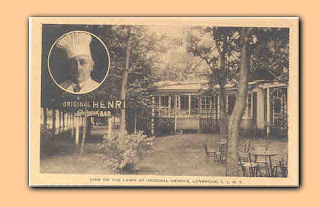 I was fascinated that Charpentier had a restaurant in Lynbrook, Long Island. That must have been considered a grand country place back then! Fun looking soup! Also, the history you wrote about shows that the restaurant business has always been a hard one. Wow. Imagine it without alcohol! 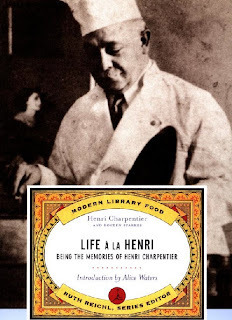 we are sure that we should find 'Life a la Henri' an absolutely delicious read in more ways than one. What a character Charpentier was and,clearly, a unique style when it came to cooking. The pea soup looks wonderful. We are soup devotees so this is a perfect addition to the list! Henri's story is proof positive that life is exactly and precisely what one makes of it, and NOT because of birth, family or connections. (There are so many examples of how the latter 3 factors hurt people, too!). Very pretty soup. What an interesting and sort of sad background to Henri's life but what a wonderful outcome. He overcame some huge odds. What a striking and beautiful spring soup! I'm inspired by Henri Charpentier's onward and upward approach to life. It underscores the mantra of the journey not the destination. This a beautiful soup. Don't you love the way research about one thing leads you to something else that interests you? I've not heard about these books and am going to peruse them via Amazon ASAP. Henri's journey was fascinating and his perseverance laudable. The soup is also new to me...your photo is lovely. Soups are so difficult to photograph, but you've done a magnificent job. The presentation reminded me of the fractal fluid examples Elena Arzak was doing at the Melbourne food festival. As a Septuagenarian retired professor of Higher Education, I despised J. Edgar Hoover; I strongly dislike green peas; I suspect that I would NOT like this soup; but I simply loved your fascinating post. Love this post. A real fantastic read. Very Jackson Pollock on the presentation. You are a true artist, my friend. I love the presentation, so very artistic, and it sounds just excellent! What a great post! And such a gorgeous soup...love that you did them separably, makes for a gorgeous presentation! Inspiring..not to mention having a peek at prices in the 30's for wonderful food.. I ate at Henri's Redondo Beach restaurant in 1963, courtesy of Fred Blackett, a South Bay resident, and his family. Henri had already passed on, but his restaurant was then run by two of his long time lady assistants. I remember being told the waiting list was 10 years long and that the USSR's Khrushev was denied dining there during his US visit in the late 50's because someone would lose his reservation. The meal was 4 hours long and at least two walks around the block to get through it all. It was an amazing experience for anyone, particularly this young lad at the time. Made it last night, following this recipe: it’s out of this world. Thank you! According to a recent interview with Eberhard Faber IV, this soup was the inspiration for the name of the Mongol pencil. That’s what prompted me to look up a recipe.